The rectorate, representatives for disabled employees, commissioners for inclusion, and the University of Freiburg staff council have signed a new inclusion agreement that addresses close cooperation in daily university life and makes provisions for a new inclusion team, regulations, and processes for personnel decisions and employment, as well as regular evaluations. 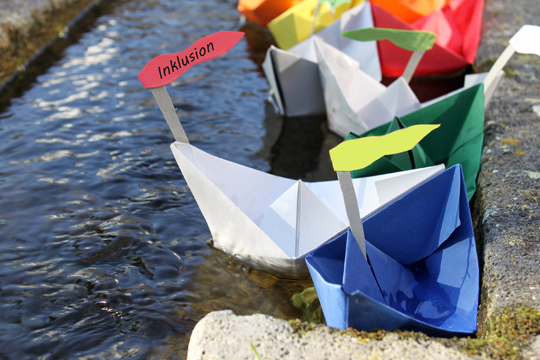 So what is inclusion all about? Manfred Zahn sits in his ground floor office at Hebelstraße 10. It’s a modern building dating back to the 1990s. It’s still early, and the sun is struggling to rise in the winter sky. Nevertheless, there’s already freshly brewed coffee steaming in colorful mugs on the table. That’s enough to make anyone feel better. As is the 12-page document that Zahn removes from a file with a satisfied smile. He’s holding the newly published Inclusion Agreement. At the end of October 2018, the rectorate, the commissioners for inclusion, the University of Freiburg staff council and the representatives for disabled employees of the University of Freiburg signed the agreement. Zahn was among those who played a significant role in the proceedings. Since 2006, he has been the elected representative for disabled employees at the university. There was an agreement back then, too. It included measures to integrate disabled employees into procedures at work. Though well-intentioned, it originated from within a majority that was granting access to marginalized groups. “Thank goodness that’s over,” says Zahn. “The new Inclusion Agreement is the result of a fundamental paradigm shift. The employees are no longer those who must integrate themselves. Instead, their environment must be shaped in such a way that all people – whether they are disabled or not – join in working life in a self-determined way,” he explains. This concept can also be found in the United Nations Convention on the Rights of Persons with Disabilities which came into force in 2008. The new accord sets standards for successful inclusion. Beforehand, a four-member team spent two years taking a close look at the situation at the University of Freiburg. They spoke to disabled employees and visited other universities and businesses to gain information on different approaches and experiences. Then they wrote the agreement. It is based on the fundamental concept that people themselves are not disabled but instead become disabled. That is why the agreement aims to create a broad sense of all the possible barriers that pop up on a daily basis, says Zahn, whether it’s an elevator that’s too narrow, a door that fails to open automatically, or a website of limited use. All-in-all, the distinction between “disabled” and “not disabled” will no longer have a role in working life at the university. The agreement’s preamble states that. Inclusion Commissioner and the university’s Deputy Head of Administration,Walter Willaredt, knows that is a lofty goal. He says even if the aims cannot be realized from one day to the next, he’s satisfied. “The result of our work is worth looking at,” adds Willaredt. Especially for those familiar with the current situation. Last year, the University of Freiburg clearly failed to meet the legally set five percent quota for employing the disabled. Willaredt says one factor contributing to that could be the age structure of university’s staff. “There is an above average proportion of young people working in the area of research. They rarely get severely ill,” he says. It’s a fact that only four percent of all disabled people in Germany were disabled at birth, while 86 percent became so as a result of illness. In other words, disability can strike anyone, even if it is only temporary, say due to a broken leg, depression, or the side-effects of cancer treatment. That’s why everyone benefits from inclusion. For five years now, Barbara Schuler has needed a wheelchair all the time. It’s been specially designed to meet her needs. Electrically-driven, the wheelchair’s height can be adjusted by eighty centimeters – “so that I can reach the top shelf” – and it’s bright red, just like a Ferrari. 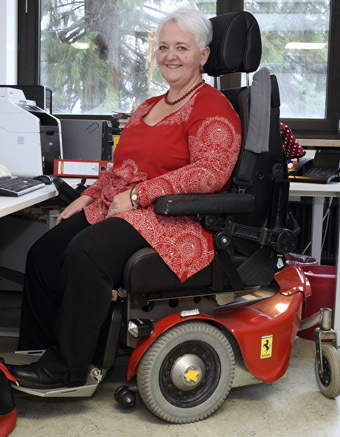 Using her 150 kilogram wheelchair, Schuler moves through her office, the library, and the institute’s hallways with grace somewhat like a dancer's. The doors that she uses continually are equipped with electric openers or motion sensors. Narrower desks were put into the seminar room that she needs to go through to get into her office. Her desk can be raised or lowered with the touch of a button, and wherever you look, there’s a gripper waiting that Schuler can use to get things out of cupboards or off of the floor. “I’ve made my work environment the best it can possibly be,” she says. But there’s still lots to do – ranging from the windows, that she can’t open on her own because the handles are too high, to the plugs on the floor, that she is unable to reach from her wheelchair. Schuler really runs into problems when she needs to go to a different university building. Sometimes there’s no ramp, or the side entrance is locked, or – as in the rectorate on Fahnenbergplatz – the elevators just aren’t big enough. “I like to compare my situation to that of someone who has a broken leg. If you’re on crutches, things you wouldn't have even noticed before suddenly become barriers. Cobblestones, curbs, heavy doors,” she says. That clearly limits opportunities for taking part in public life, and not just for the disabled but the elderly, children, pregnant women, or parents with strollers, for example. Barbara Schuler was recently elected a representative for disabled employees. She’s pleased about the signing of the Inclusion Agreement. “It would be fantastic if it’s implemented quickly – so that rather than being the exception, inclusion is soon the rule,” she says.